A few miles south of Fort Matanzas is the 157-hectare (389 acre) Washington Oaks Gardens State Park. This small park lies between the Atlantic Ocean and the Intracoastal Waterway. The hammock forest on the Intracoastal Waterway side provides good birding in fall and spring. But the real treasure is on the ocean side, directly across the highway from the main entrance sign to the park gardens. A narrow road leads to a parking lot behind the dunes. This provides public access to one of north Florida’s most unusual and least crowded public beaches. 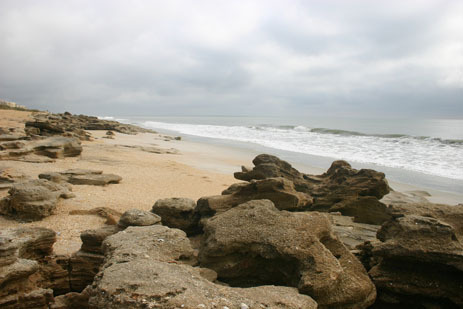 Unique rock outcrops of coquina – fossilized seashells bound together by a matrix of dissolved calcium carbonate – protrude from the sand. Tidal pools and unusual rock formations make this beach great fun for older kids (and ecotravellers).